What’s The Data Behind Patricia Arquette’s Speech? Let me preface this with saying I would never use celebrities as a source of political opinion, but if you were, make sure you know exactly what’s behind it. One of the most talked about Oscar acceptance speeches yesterday was from Patricia Arquette, for winning Best Supporting Actress, gaining much of the attention for stating that women still make only 77 cents to every dollar a man makes. A chilling statistic to say the least, and also garnered quite a reaction from Meryl Streep. But was it long enough to explain why that gap exists? Bringing Arquette’s claim into perspective, that means that if a male worker makes $48,000 and some change, which is what the 2014 recent college graduate made, an equivalent female worker would make only $37,000. Surely, putting the claim into these terms sets off a few red flags for all of you. Either we live in a society where companies are blatantly paying individuals in adjacent cubicles $10,000 more, or less, based solely on gender or the statistic isn’t doing a good job at capturing the state of our Nation. To properly examine Arquette’s claim, which is stemming from one of The President’s most cited statics, we first need to understand how that claim is computed. The statistic comes from the Census Bureau, which takes the median earnings of all women and divides that by the median earnings of all men. 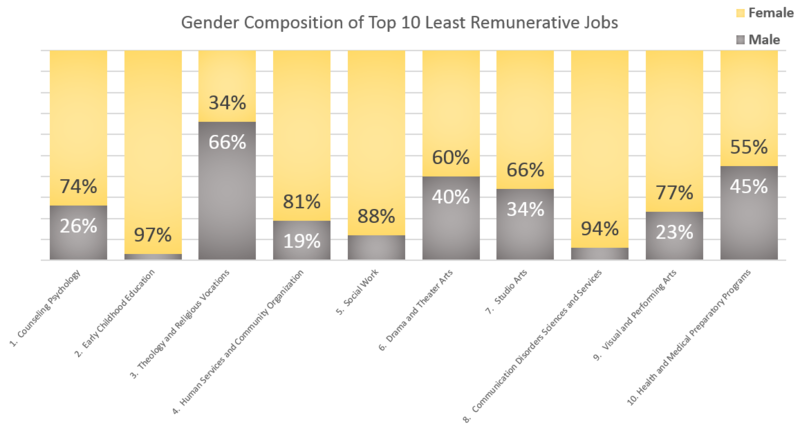 This gives the “middle number” of salaries for both males and females. 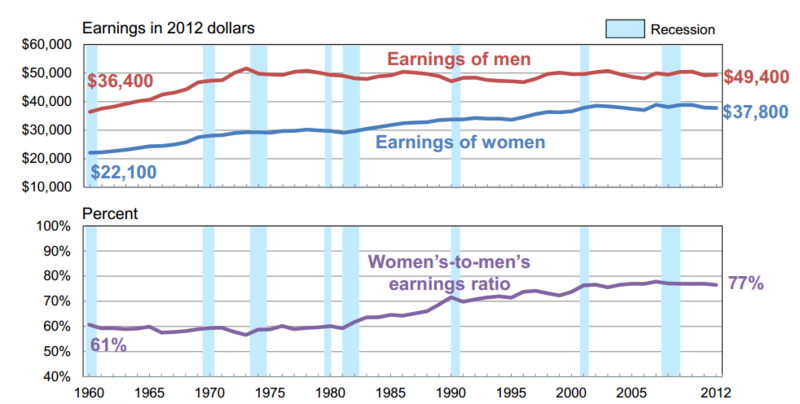 It’s important to note the strides that Americans have made in closing that gap up until 2005, which then appears to stagnate around 77 cents for every male dollar. A different viewpoint from the Labor Department’s Bureau of Labor Statistics tells a story of even smaller differences between hourly workers on a weekly scale, of only 81 cent to every male dollar. Nonetheless, if society had been doing so well in recognizing and closing this gap for the past 30 years, why would it suddenly stop? Better yet, why aren’t companies paying women the same as men? 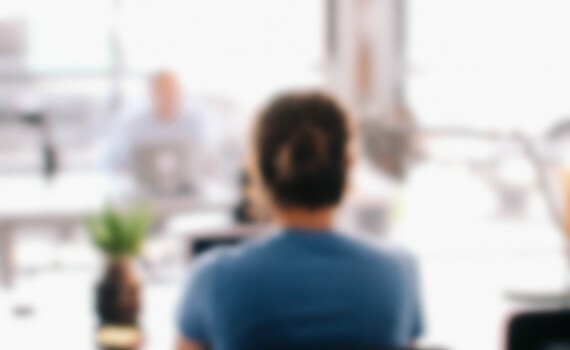 Many factors could play into why men could be making more, one of the most popular arguments is that women are most often the ones to take time off of their job to care for children or look for jobs with greater flexibility to do so, at the cost of some salary. However many professional jobs are now offering great benefits in this area, in addition, many companies are realizing the difference that providing greater child care benefits can make and both parties are better off with the investment. At this point, I’m sure those red flags that were raised from the beginning of this article still haven’t come down yet. So what else is there? 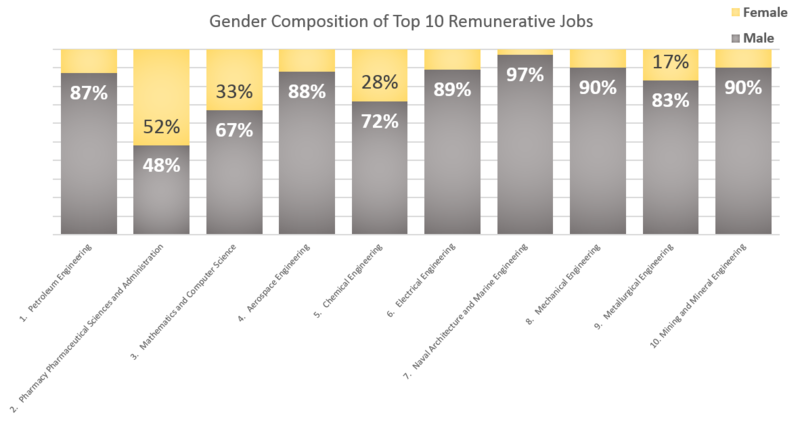 Clearly, besides Pharmaceutical Sciences (great job though, ladies), a very male dominated environment is seen within the highest paying majors across industries. Therefore, as the supply of science and mathematical driven males comes through the system, companies are left with little choice but to fill these positions with predominately males. That being said, industries are reporting, tech industry along with others, that no wage gap actually exists within these positions. Consequently, these majors that women are choosing are the professions they go on to fill, which tend to be lower paying professions. While the scope of this article doesn’t delve into details of why these professions are lower paying, a great explanation would be the large influx a women entering the work force since the ’60s or late ’70s causing the job markets previously described to be saturated with workers, pushing wages down. Simple supply and demand. Looking at the data in this manner, it appears as though the gender gap isn’t a result of companies willfully discriminating against women, but rather the gender disparity of the fields themselves. To be sure, this article isn’t trying to argue there isn’t a gender gap, and that males and females are paid identical across all industries or even companies. However a 27 cent difference, or $10,000 as outlined previously, between George and Sally simply cannot be from gender bias from a company’s salary offerings of similar individuals. While evidence may never be conclusive, it most certainly leads to questions whether or not we are truly facing a discrimination against women on wage, but rather a deeper societal problem of how we mold and inspire our young women to be when growing up or perhaps something as simple as career preference.